Our Android App is out. 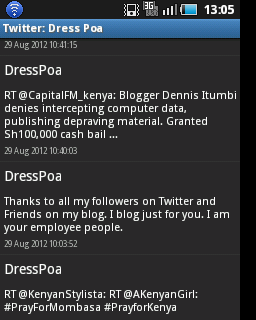 Dresspoa Android App has been released. After months of coding, we are happy to announce the publishing of our android application. Our followers can now download our app if they have android enabled phones. Twitter updates from us. - Users can RT our tweets or reply to them. Facebook. Yes Facebook. Our users have a chance now of accessing Facebook right from our app. This will enable them to access our wall, share a pic or a status update. What's more? Our followers can too access their own Facebook walls, News feeds, Inbox, Notifications and all else that they enjoy on the normal Facebook app. This is a good measure since the normal Facebook Android App is usually bulky and occupies a lot of space on the phone (nearly 30MB). Too, the normal Facebook Android app has a lot of Force Closes, unlike our integrated Facebook in our app which is smooth and easy to use. Call us. Our followers now can call us direct from the app. Events. Users can access our events and share them through SMS. Here are some screen shots from the app. If you like what you see, download the app from Get the <a href="http://slideme.org/application/dresspoa">Dresspoa</a> Android app from <a href="http://slideme.org/">SlideME</a>. 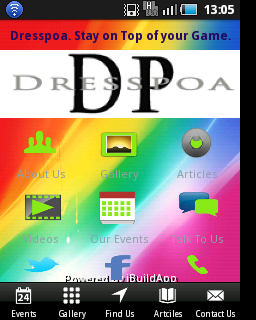 Get the Dresspoa Android app from SlideME. If you have any reviews or queries, please comment on this post and i will respond to all your queries. If you have problem downloading the app , please email me at dressypoa@gmail.com and i will send you the application so that you can install it on your android phone. In case you have problems using the application let us know. 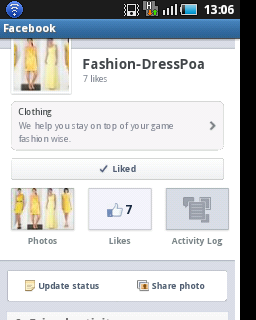 Now access our blog articles, pictures, fashion tips, twitter, facebook and our events from your phone. Dresspoa : Stay on Top of your Game. This is great. Thanks admin. is quite a good add on. The satisfaction of our followers is our core mission. @Von thanks for the compliments. The app will help our blog followers get our articles right from their android phones. We wl b releasing the iphone app too.